A few minutes ago, Richard mentions in an fb status update that he's whistling, "I Saw Her Again Last Night". Immediately, I'm transported back to my childhood bedroom, listening to WABC on the radio and reading Marvel comics. This has happened countless times. I'm sure it's been researched (though a quick google on "music induced visual flashbacks" yielded nothing), but it's always striking to me how consistently this occurs, that linkage between a song and, in my case, reading comic books. Just let me hear, or even hear a reference to, a pop song from, say 1966 to '71 ("the Letter", "Hello, Goodbye", "Groovin'"), and what transpires in my head, in addition to a scarily note for note, word for word reproduction of said song, is an image from Hulk, Nick Fury or Doctor Strange. Not necessarily an actual image, but a range of inks, certain colors, even the smell of the comic. (I know olfactory sensations often carry the most powerful nostalgic associations). But the merest suggestion of one of these songs and there I am, lying on my bed, devouring the latest batch of Marvels, hastened back from Sandy's Breyer Patch where me and another fanatic would bedevil him into prematurely opening the stack of new arrivals, beseeching him to let us use his wirecutters to unveil that month's cache. Guessing, I imagine it has to do with going through puberty, discovering things in the wider world, beginning to differentiate between "stuff" and "art", how important that would have been for someone that age. Jeez, you'd think a pop song might mentally connect me with some girlfriend, but nope, just comics. Geek in training. Lately, it's been the colors as such, the inks. That period, in Marvel, was one of experimentation in many aspects but one that doesn't get mentioned often (not like I follow discussion on this, but I bet) is the coloring, the ink techniques. I didn't realize at the time that the artists, the Sterankos, Buscemas, Adams, etc. pretty much just did pencil drawings, leaving the inking and coloring to someone else. Little by little, I realized that I enjoyed those comics inked by Joe Sinnott more than others; his thick, sensuous line held far more appeal than the relative scratchiness of his cohorts. But the coloring began to get interesting too. The introduction of black matrices for shading was way cool; I remember it in some Adams-drawn things and the inker/colorist's name I recall is Tom Palmer--not sure if that's right. [Just checked--yep, that was he. Has a whole book on the subject: Tom Palmer: The Art of Inking Neal Adams] In addition to the black or gray-scale shading, there was an increased use of super-saturated colors, rich purples and dark greens that threatened to stain one's fingers. Those were what have been leaping to mind lately when "Hurdy-Gurdy Man", "Love Is Blue" or "Last Train to Clarksville" flits across my consciousness. Curious how common this is. Gotta be. Oh, man, I was singing "Love Is Blue" yesterday! Scary how similar some of our childhood recollections are Brian. I grew up with comics as well, and link certain sounds back to the many quiet hours I would spend locked away with a pile of them. I tend to link television to them more though, mainly because I don't really ever watch TV these days, but back in my formative years my life would be scheduled around the box. When I left full time education I tried hard for a while to break into comics, with inking actually my speciality. I have recently written a somewhat peculiar piece for submission somewhere that tries to link my interest in negative space and clearly defined moments in music to my need to draw lines around things visually, either in my head, or in the case of comics,quite literally. By the way, have you seen a Marvel comic recently? the colouring is all computerised now... it looks terrible. Hey Richard, thanks for that, interesting. Well in certain parts of Europe there are comics (or bandes dessinee to be more precise) that are only for adults and are written and considered on a level with other literature. If you think about it, combining the visual with the written word makes perfect sense, and its only our cultural connections to comics as items for children that make the idea of reading words and pictures at the same time an odd thing to consider. Have you ever read Chris Ware's work Brian? As well as tapping into the same degree of nostalgia that you mention above, his writing is very powerful. His Jimmy Corrigan book is one I would happily recommend. I haven't kept up with the genre, to be sure, but in the 80s I read some Frank Miller graphic novels and the like (my brother Drew, who inherited my comic collection, had them) and, while relatively ok, I think they're way, way over-rated as "serious" lit. I like Sin City as much as the next guy (more maybe), but it's not Andrei Rublyev. Don't know the work you cite, though--I could well be wrong. My free (and not so quiet) pre-teen hours were spent, near Detroit, with the music of the Jackson 5, the Four Tops, Al Green and the Temptations - so I only came to comics as an adult - and then to the work Richard mentions, which I also wholeheartedly recommend (Chris Ware, Jimmy Corrigan). It's not Dostoevsky either - maybe George Perec. I'd say that Ware is a good few levels on from Frank Miller Brian. I never enjoyed Miller at any point, mainly because his subject matter didn't ever stray from the standard comic book fare, just the same stories a bit grittier. Coincidentally, today's NYT has a feature on a DC comic with a real-life (more or less) Ugandan theme. I think, if I can encapsulate my issues with comics as such as storytelling vehicles, it has to do with the constrained visual field that comes with the territory and, within that (this may seem trivial) the lines around things. At a glance, I can grasp (I think, perhaps I'm wrong) everything there is to grasp in a given panel; there's no ambiguity, no multiple layers of possible meaning. In a (good) film, this isn't the case, much less in a novel where you're mentally recreating the goings on with huge amounts of shifting, reorientation, etc. It's too constrained, in a word (for me). Even those lines (which I take it are still a going thing) visually simplify things too much for me. I know people have strongly held opinions on the matter and don't want to get into arguments about it. It's like explaining why I find nothing of value in Springsteen! That is interesting Richard, I too tried to break into comics as an inker. When my daughters where in grammar school one of their classmates' parents where both big time comic artists - Tom Mandrake and Jan Duursema. 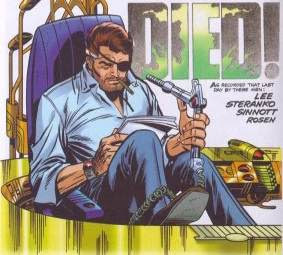 We became good friends and then through them i got to know lots of comic royalty like the Kubert brothers and writer John Ostrander. So into the comic world i got that i had the idea to be an inker myself. I did lots of apprenticing for Tom on 'The Spectre' for DC and a few other artists and even got to ink a short 'Spectre' story for DC. And then the business went south and i never could get a steady gig. It's like explaining why I find nothing of value in Springsteen! Oh, man, I was singing "Candy's Room" yesterday!